Basic components of a solid propellant rocket motor. A solid-propellant rocket motor is the simplest of all rocket propulsion system designs. A solid-propellant rocket motor consists of a casing, usually steel, filled with a solid propellant charge, called the grain, which contains all the chemical constituents (fuel plus oxidizer) for complete burning. When ignited, the propellant compounds burn rapidly, expelling hot gases from a nozzle to produce thrust. 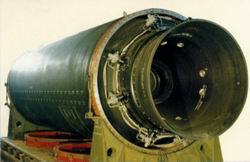 The propellant burns from the center out toward the sides of the casing. The shape of the center channel determines the rate and pattern of the burn, thus providing a means to control thrust. Unlike liquid-propellant engines, solid-propellant motors can't be shut down. Once ignited, they burn until all the propellant is exhausted. Solid propellant motors have a variety of uses. Small solids often power the final stage of a launch vehicle, or attach to payloads to boost them to higher orbits. Medium solids such as the Payload Assist Module (PAM) and the Inertial Upper Stage (IUS) provide the added boost to place satellites into geosynchronous orbit or on planetary trajectories. The Titan, Delta, Ariane, and Space Shuttle launch vehicles use strap-on solid propellant rockets to provide added thrust at liftoff. The Space Shuttle uses the largest solid rocket motors ever built and flown. Each booster contains 1,100,000 pounds (499,000 kilograms) of propellant and can produce up to 3,300,000 pounds (14,680,000 newtons) of thrust.